a disturbance on the street, he stepped in to see what was the matter. A big fellow crazed by drink, thrust a saber through Mr. Crippen's body and turned it before withdrawing the blade. No one expected the wounded man to survive, but so hardy is he that even a mutilation such as this did not kill him. Mr. Crippen was first married in Mansfield, Pennsylvania to Miss Juliette McConnell, a native of Tioga county, and daughter of Justus and Hannah (Bryant) McConnell. Four of their children lived to maturity and married: Martha, deceased, was the wife of Thomas Houselander, their son, Earl, being the first to confer the honorable title of great-grandfather; Edith married Charles McCudden, of Sioux City; Mary is the wife of Oliver W. Nelson, engaged in automobile work in Plainview; and Ethel married John Weiler, also of Plainview. Mr. Crippen was a second time married to Mrs. Matilda Morton, who, like her parents, Ambrose and Catherine (Arnold) Colson, was a native of Maine. After the death of her husband, Edwin Morton, she brought her two daughters to the west, where she had relatives, reaching Plainview in July, 1887, her parents following that fall. Her elder daughter, Angelia, is the wife of S. H. Finney, of Chadron, Nebraska, and Bertha married John L. Lapini, deceased, and lives in Plainview. During his early years in Nebraska, Mr. Crippen experienced all the hardships of the frontier. On one occasion, on coming to Plainview with his father for coal, they found but two hundred pounds for sale, which they loaded on their wagon and started home. On the way they noticed a neighbor and his wife busily at work near the side of a haystack and wondered what they were doing. By driving in and inquiring, he learned they were twisting hay for fuel. For the next two years his house was heated and their food all cooked with twisted hay. Corn was their fuel at times, and since moving to town Mr. Crippen has used it from time to time, paying for one lot seven cents a bushel, which was a much cheaper fuel than coal at the prices for which that commodity was selling. He saw the last flight of grasshoppers here in 1879, and although he thought them numerous, the earlier settlers who had seen them at their worst, assured him these swarms were very small. At the time of the blizzard of October, 1880, Mr. Crippen, with some neighbors was engaged in railroad construction near Niobrara. They were camping in the canyon under the canvas top of a covered wagon, which they had set up in a grove of small willows with the tree tops laced above. With their camp fire roaring at the front of their fragile domicile, they were quite comfortable despite the raging storm. During the blizzard of 1888, Mr. Crippen was in town and made two efforts to get home, but could go only a little distance before having to turn back. Going with a party to the schoolhouse to rescue the children, he had the presence of mind to ring the bell which guided some who were lost on their way to the school and others who had started home and became bewildered in the storm. At his suggestion the bell was kept ringing until after midnight. Deer and antelope were plentiful and so tame that they would feed at any time near the dugout of the settlers. At one time an antelope chased back to the house a puppy that was barking at it. Such incidents are typical of the frontier, and they can never be seen again. Mr. Crippen is a highly respected citizen, being a member of the Methodist Episcopal church and also of the Independent Order of Odd Fellows. In political belief, Mr. Crippen is a republican. Benjamin Franklin Holmes, a successful grain and stock farmer living near Arcadia, Nebraska, and a prominent man in his community, is a native of Clayton county, Iowa, born January 25, 1869, eighth of the ten children born to Joseph M. and Mary (Powell) Holmes, the father of German and English, and the mother of English extraction. Joseph M. Holmes was born in New York and died in Valley county, Nebraska, in March, 1908, and the mother, a native of Marion county, Ohio, died June 20, 1911. Besides Frank Holmes, there are four other sons and two daughters in Valley county, one son in Custer county, and one daughter in Dakota; the other children are deceased. In 1884 Mr. Holmes accompanied his parents to Cedar county, Nebraska, and two years later the family removed to Valley county, where the father secured a homestead of one hundred and sixty acres of land on section four, township seventeen, range fifteen. For twenty years Mr. Holmes, in partnership with his brothers, Samuel, Joseph and William, carried on farming. William Holmes is now deceased. Together they purchased eight hundred acres of land in Valley county, which has since been divided into three parts, of which Frank received one. March 20, 1907, Benjamin F. Holmes married Miss Etta Teeter, a native of Harrison county, Iowa, daughter of Frank and Charity (Markley) Teeter. Her father resides in Butler county, Nebraska, and her mother died in Iowa in 1884. Mrs. Holmes has three brothers in the state of Washington, one brother in Utah, one sister resides with Mrs. Holmes, and two sisters are dead. Two children were born to Mr. and Mrs. Holmes, Ivan L. and Earl E.
most upright and useful citizens in his part of the country and stands well in his community. He served three years as road overseer and for some years was moderator of school district number fifty-nine. Mr. Holmes with his family is a member of the church of the Bretheren, formely [sic] known as the Dunkards. In politics he is a democrat. Prominent among Madison county old settlers is Christian Enderly, who, since the fall of 1883, has made this region his home and done his share in the developing of the agricultural resources of this section of the county. He lives in a pleasant home on section twenty-four, township twenty-four, range one, surrounded and loved by a host of friends, acquaintances and neighbors. Mr. Enderly is a native of Germany, his birth occurring in Baden, November 9, 1828. He grew to his young manhood in the old country, where, in 1851, he served as a soldier in the Prussian army. While in the army, Mr. Enderly wanted to get married, but could not while in his country's service, so he and his bride-to-be, Miss Catherine Getzel, came to America, they being married November 28, 1853. Mr. and Mrs. Enderly are the parents of twelve children, whose names are as follows: August, George, Kate, Fred, Will, Edward, Minnie, Lena, Caroline and Emma, living; and Louis and Annie, deceased. Mr. Enderly first came to Toledo, Ohio, in 1853, and remained one year, then went to Quincy, Illinois, remaining there four years. In 1858 he went to Des Moines, Iowa, where he lived for many years. In 1873 Mr. Enderly came to Nebraska, settling in the northeastern part of the state, in Brown county. Here he took up a homestead claim, on which he put up a shanty, living in this county for ten years. In 1883, he came to Madison county, Nebraska, purchasing six acres of the finest land in the county, and has improved this to a high degree; he has on this choice land one hundred splendid fruit trees. Mr. Enderly is a gardener by occupation, and well understands his craft, as is evidence by the appearance of his beautiful home and grounds. Mr. Enderly is a highly respected and esteemed citizen of his locality, loved and revered by all who know him, and his friends and acquaintances are many. He is a member of the Lutheran church, and a democrat. Edward G. Taylor is one of the younger self-made business men of his section and has extensive interests in various lines throughout central Nebraska. He is director and former president of the Loup City State Bank, which was originally organized in 1904 and purchased by him and his business associates in 1906. He is president and one of the organizers of the Sherman County Telephone Company, which has a paid-up capital of fifty thousand dollars. Mr. Taylor was born at Ashton, Lee county, Illinois, December 12, 1867, a twin of Fred, (deceased), and one of a family of seven children born to John P. and Susan (Bridge) Taylor, mentioned at length elsewhere in this work. The family went to live on a farm when Edward G. Taylor was three years of age, and nine years later, in April, 1879, the parents, accompanied by their five sons and two daughters, came to Sherman county, locating on a homestead farm eleven miles southeast of the county seat, Loup City. The father was one of the original homesteaders of that part of the county, and became one of the most influential men in the community, erecting one of the first two frame houses in central Nebraska. The subject of this review remained on the home farm until reaching his majority, received the advantages of a district school education and a few years at high school at St. Paul, Nebraska, before he was twenty-one, and in 1888 entered business college at Grand Island. In the spring of 1889 he and his brother-in-law, A. N. Conklin, engaged in general mercantile business in the new town of Ashton, which was located near the Taylor homestead, and continued in this business until the spring of 1895, when Mr. Taylor sold his interest to his partner and embarked in the grain business at the same place. He was most successful in buying and shipping grain and stock, and in September, 1903, moved with his family to Loup City, where he had for some time been interested in an elevator. He continues to deal in grain and stock at several stations on the railroad, shipping from Schaupps, Farwell, Ashton, McAlpine and Palmer, as well as Loup City, on the Burlington and Missouri Railroad. He owns one of the finest and most modern residences in the city and he and his wife are closely identified with the social, educational and religious life of their community. They have many warm friends and both have shown an intelligent interest in local affairs and events. He is keenly interested along political lines and in personal views is an independent democrat, though he has never held public office or cared for political honors. cile Harriet. Mr. Taylor is a Presbyterian, and a staunch republican. During the early days, many were the hardships the family endured. Coarse weeds and cornstalks were their only fuel for a time. Water for stock and family use had to be hauled four miles, until a well was dug, theirs being the first on the table land. The October blizzard of 1880, which inaugurated the winter of the deep snow, caused them much inconvenience. The father was away, working at St. Paul, leaving the boys to look after the farm work. The stable, which was in a ravine, was completely covered by snow during the three days of storm; water and feed were passed down through a hole dug in the roof and when the storm had abated, a tunnel had to be dug through the deep drifts to the door before the stock could be led out. The blizzard of January 12, 1888, found Mr. Taylor at school in St. Paul. Among the leading public spirited citizens of Merrick county, Nebraska, the name of William H. Crites merits a foremost place. He is a man of more than ordinary ability and has gained the esteem and confidence of the people of his state and county. William H. Crites was born on a farm in Scioto county, Ohio, March 6, 1841, and was the second of nine children born to John and Cecelia (Heath) Crites, who had six sons and three daughters. John Crites was a native of Virginia, and Cecelia Heath was born in Ohio. In the month of February, 1853, our subject's father and family moved to Mason county, Illinois, going by steamboat, and landed at Havana, March 4th. Six months later they settled on a farm. William H. Crites, subject of this sketch, in his twelfth year went out on the farm of John Auxier, in Mason county, Illinois, and herded cattle seven months, going to school during the three months of the winter term. Mr. Crites spent his youthful days in Mason county, having the usual experiences of the farm boy in those early days. Mr. Crites, on August 12, 1861, enlisted in Company E, Twenty-seventh Illinois Volunteer Infantry, and was honorably discharged from service September 20, 1864, in Springfield, Illinois. The war record of Mr. Crites is of unusual interest, as he was active in a large number of principal engagements; a list of which is herewith given: Belmont, Union City, Island Number Ten, Farmington, Siege of Corinth, Levergne, Stone River, Chickamauga, Mission Ridge, Rocky Fade, Resaca, Dallas, Mud Creek, Peachtree Creek, Kenesaw Mountain and Atlanta. He was wounded a number of times and had many narrow escapes from capture by the enemy. Upon being mustered out Mr. Crites returned to Mason county, Illinois, and to the farm. Mr. Crites married in Lincoln, Logan county, Illinois, September 18, 1867, Miss Phoebe Saxton, a native of Ohio. Mr. and Mrs. Crites are the parents of the following children: Myrtle, who is married to Mr. Walter Gillette, has five children and lives in Idaho; Iva, married to Mr. Fred Marsh, has six children and lives in Merrick county, Nebraska; Clay H., deceased, survived by his widow and four children who live in Central City; Evan, who is married and has one child, resides in Merrick county, nine miles north of Central City; Ella, married to Mr. John Kyes, has two children and lives near Archer, Nebraska; Ethel, who is married to Mr. Ernest Hanna, has one child and lives at Lexington, Nebraska; and Frank, who is attending Friends college at Whittier, in California. After marriage, Mason county, Illinois, was the home of Mr. and Mrs. Crites, with the exception of three years' residence in Menard county, Illinois. Leaving Menard county in September, 1871, they came to Lone Tree station on the Union Pacific railroad. Lone Tree is now Central City, Nebraska. Here they took up a pre-emption claim, and in 1873 homesteaded land twelve miles northwest of Lone Tree. In 1874, during the hard times caused by the grasshoppers, Mr. Crites went out on a buffalo hunt, lasting some months, to procure meat for his family, and also for money derived from the sale of hides, etc. They lived on the homestead where they followed farming and stock-raising until 1903, coming at that time to Central City to reside. Mr. Crites has been an active man along all lines during his residence in Merrick county, and in the fall of 1887 was elected sheriff of his county on the republican ticket, and served two terms, during which he lived at the county seat. He has also filled many of the township and precinct offices of his county, and in 1880 and 1881 filled the office of postmaster at Bethel. He is a self-made man, going out in life for himself at an early age, his parents both dying soon after removing to Illinois. He is successful and well and favorably known. The gentleman above mentioned is counted among the oldest settlers in Knox county, and since locating here in 1873, has taken a foremost part in the development of this region. He has gained an enviable reputation as a progressive citizen and a man of straightforward character, and has built up a good home in section thirty-four, township thirty, range eight, where, with his family, he occupies a comfortable residence, and is held in the highest esteem by his fellow men. Mr. Allen Chicken is a native of Ohio, and was born November 25, 1838. His father was John Chicken, a well known farmer of that region, who died when our subject was a small boy. When about twenty-seven years of age, Allen left home and went to Iowa, remaining for about eight years, soon afterwards coming to Nebraska and selecting a location in Knox county. He filed on a homestead, which forms part of his farm, started to improve the land, and built his first dwelling place. which was a house made of logs. Grasshoppers destroyed his crops in 1873, 1874 and 1875, but after those years he was able to raise some crops, and soon began to raise live stock. grain, etc. As the years went on conditions became more favorable, and he increased his holdings in land and stock, until at the present time he is known as one of the leading men of his locality, taking an active part in every movement started for the betterment of conditions in the region. He now owns two hundred and forty acres of land. During the early part of his residence here, he was one of two men being the possessors of a horse apiece in the section, all the other settlers owning oxen, with which they did all their teaming. In the summer of 1875 a hand of thieving Indians came along and stole his horse. They also took with them his only cow and a calf, which at that time was a serious loss to him. Mr. Chicken was married in Iowa, November 24, 1867, to Miss Mary Grim, a, native of Ohio. They are the parents of four children, namely: Sarah E., now Mrs. Charles Van Kleek; May Etta, wife of Alexander Copple; Lillie Viola, wife of Frank House, and Wilmer H., who married Katie Bouy. The Buckeye state is well represented in the successful men of the west, and one of her representatives who stands well in the community where he has resided so many years, is James M. McCumber of Butte, now retired and occupying a new bungalow residence on the southwest side of the town. Mr. McCumber was born in Meigs county, Ohio, December 18, 1849. His parents, Daniel and Mary (Henry) McCumber, were both natives of Ohio. The father served three years and three months during the civil war as drum major in the Ninety-second Ohio Infantry, and came out with health so much impaired from a tumor in the abdomen that he lived but a few years after the close of hostilities. He came with his family to Carroll county, Missouri, and died shortly after his removal to that state. The mother is living with a daughter in Ellsworth, Kansas, at the advanced age of eighty-two years. The Grandfather Henry, came to Missouri some years before the McCumber family and had secured a large tract of land at the old government price of one dollar and twenty-five cents per acre, and died here at a good old age. James M. McCumber was married in Carroll county, Missouri, and farmed there until his migration to Nebraska in September, 1884. He settled first on a farm he purchased twelve miles northwest of Ainsworth, and resided here for eight years, during which they experienced their hardest times; drouths, storms, hail - everything seemed to conspire in working havoc with their prospects and their crops. When Boyd county was thrown open for settlement in 1892, Mr. McCumber filed on a homestead on the west line of the county, about seven miles north of the Keya Paha river, and, in addition, bought three quarters of a section of school land, making an even six hundred and forty acres of excellent land for farming or ranching. In 1899 he came to Butte and bought eighty acres at the southeast corner of the town. He resided here until the spring of 1909, when he sold and moved into the city limits, building his present comfortable home in the summer of 1910. For three years Mr. McCumber was in the implement business, selling to Mr. Krotter, and devoting his time thereafter to his farm. So rapid has been the advance in lands in Boyd county that the eighty acres brought one hundred and five dollars per acre when Mr. McCumber parted with it. The fine, large residence on the place is in strong contrast with the "soddy" occupied during homestead days, although it was a large one for the times. James M. McCumber was married in Carroll county, Missouri, January 22, 1872, to Miss Lucinda Jennings. She was born in Missouri, and was a daughter of John and Nancy (Bingham) Jennings, who lived and died in Missouri. Six children were born to Mr. and Mrs. McCumber, all of whom are living. They are Edmond, who is owner of the Brockman Ranch in Keya Paha county, consisting of two thousand acres, that has rapidly advanced in value the last few years until it is now well worth from sixty thousand to seventy-five thousand dollars; Everett, who is on the ranch of his brother Edmond; Norman, in the real estate business at Gregory, South Dakota, and doing well; Oma G., who is the wife of Mr. John P. Wood, one of Butte's leading business men, of whom a more extended mention is made on another page; Earl, who is proprietor of a meat market at Caspar, Wyoming; and Maude, who remains as yet under the parental roof. Mr. McCumber is a republican in politics, a member of the Methodist Episcopal church, and is a brother in the Odd Fellows and the Ancient Order of United Workmen. where Mr. McCumber found them after the storm abated, none the worse for their run. It necessitated a three mile walk after the mules and the return for the wagon. During the blizzard of January 12, 1888, Mr. McCumber was living on the ranch in Boyd county and had a narrow escape from probable death. Had he been a little earlier in his projected trip to town, he would have been out in it. As it was, the team was hitched to the wagon to start when he heard the loud rumbling noise of the approaching cloud of whirling frozen mist. Hastily unhitching, he got his team into the barn and made his way back to the house by means of a rope to which he held until he reached his door. But the early pioneers inured to hardship, paid little heed to storms or drouths or prairie fires. They had the fortitude to meet all emergencies and overcome them. Joseph Westbrook, deceased, was for many years one of the most extensive farmers of Beaver precinct, Boone county, and also one of the first settlers in that section. He was the possessor of an active public spirit and broad mind, and was one of the men who so materially aided the development and growth of the county and state. His demise occurred in 1908. Mr. Westbrook was born in Chillicothe county, Ohio, on September 13, 1835, and grew up in that vicinity. He was married in July, 1856, to Mary Jane Ross, who was also a native of Ohio, their union occurring in Livingston county, Illinois, and they made the latter place their home for twelve years, then moved to LaSalle county, After two years there, they moved to Iowa, settled on a farm, and after raising one crop, came on to Boone county, landing here in the spring of 1871. Mr. Westbrook homesteaded on the southwest quarter of section twelve, township eighteen, range five, and this place remained his home farm until his death, which occurred in April, 1908. Six children were born to Mr. and Mrs. Westbrook after settling in Boone county, the first, Henry, being the first white male child born in the county. At his death, Mr. Westbrook was survived by his widow and eight children, three still living here, also Mrs. Westbrook, who all live on the farm in section eleven, near the old homestead. Two other children live in Nance county, and three in Columbus. The entire family is well known and greatly respected through the country, being among the first to settle here. They went through many hardships in getting started, landing with just fourteen cents after filing on the claim, and can fully appreciate the word "pioneer," having gone through every form of frontier existence. David R. Westbrook, now the head of the family, was born at Buckhart Grove, Illinois, on April 25, 1857, and is the eldest of eleven children. He and his father came to Boone county before the balance of the family, arriving in June, 1870, and on July 14 of that year, Joseph Westbrook filed on the homestead, after which the family returned to Iowa, and in the following year brought the entire family to Boone county. He can well be called one of the founders of the county, and to his aid and influence is due much of the present prosperity enjoyed in the section. One of the prominent farmers of Wayne county is Howell Rees, who owns a valuable estate there, located on section thirty-five; township twenty-seven, range one. He is a well-known citizen, and is highly respected for his integrity and industrious life. He has a pleasant and comfortable home and enjoys well deserved success. He has done his full share in building up the agricultural interests of the community. Mr. Rees was born in 1857, in Glanmorgan Shire, Wales. He remained at home with his parents, David and Mary Rees, until 1879. At this date, he left his native land for America, coming from Liverpool to New York City by the steamship "Montana." From there he started for the west, coming first to Montgomery county, Iowa, where he remained for twelve and one-half years. In 1891, Mr. Rees decided to locate permanently in Wayne county, Nebraska, and with this purpose in view purchased his present home, which he has steadily improved until it is now as fine an estate as one would wish to see. Not among the least of his improvements, is a fine, thrifty grove, which he planted himself. He also has plenty of fruit. He has brought the land to a high state of cultivation and aided thereby in the development of the agricultural interests of his locality. In 1885, Mr. Rees was united in marriage to Miss Maggie E. Jones. They are the parents of six children, named its follows: David, William H., Franklin T., Mary, Owen and Clifford. Mr. and Mrs. Rees are prominent in the social life of the community and enjoy the respect and esteem of all with whom they have come in contact. refuses to give up, no matter what the discouragement may be. All that he has is the result of his own efforts, and his sterling character has long been recognized by his fellow citizens, who hold him in the highest esteem. Mr. Colander was born in 1859, in Sweden, to Andrew Colander, and Anna (Klocker) Colander. His father died when he was a child, and, with his mother, he went to America in 1870. The start was made in May, and they went across the North Sea to Liverpool, thence to New York by steamship. They went at first to Omaha, Nebraska, in June, and as the mother's money gave out at this point, they were forced to work here for two years, until they had again saved enough capital to warrant taking up a homestead. This was done in the mother's name, the homestead chosen being located in section eight, township twenty-four, range two, east, where our subscriber now resides. The first few years they were here, a sod house sufficed for their needs, a frame house being erected later. For a time they met with more than the usual share of misfortunes suffered by the pioneer. In 1878, they lost everything they had by prairie fire, and for the first few years, the crops were utter failures, due to the grasshoppers. However, the word "fail" was not found in the vocabulary of these two thorough pioneers, mother and son, and they persevered, and by untiring industry, gradually turned the tide of fortune in their favor. The farm has been improved in many ways. There is a fine orchard now bearing and also three acres of forest trees, all of which were planted by the mother. In 1882, Mr. Colander was united in marriage to Miss Anna Klocker, and five children have been born to them. They are named as follows: Louise, Lillie, Sadie, Alice and Esther. Samuel G. Puryear, who resides on section thirty, township twenty-eight, range five, Antelope county, Nebraska, is one of the leading oldtimers in this section who has ever done all in his power to better conditions throughout the community in which he chose his permanent home. Mr. Puryear was born November 28, 1856, in Henderson county, Illinois, and is a son of John and Mary (Beek) Puryear. The father was born in Tennessee about 1825. He was a union soldier in the Mexican war, participating in the battle of Buena Vista, where he was wounded while assisting in moving a cannon up a hill. The mother was born in April, 1835, in Belfast. Ireland, from whence her father emigrated about 1849, settling near Oquaka, Illinois. There she was married and removed to Iowa about 1857, where Mr. Puryear filed on a quarter section near Burlington, under a soldier's warrant granted him for services rendered in the Mexican war. He later sold this land and moved to Minnesota, where he lived for five years, migrating in 1865 to Pottawattamie county, Iowa, and settling on a farm east of Council Bluffs. Samuel G. Puryear first came to Nebraska in 1892, sojourning for two years in Cuming county, before permanently settling on the farm he now occupies. Since settling in the state, Mr. Puryear has prospered and each year he has improved his farm by needful additions to the equipment of the place, making of it one of the best in the beautiful northern section of Antelope county. He is engaged in stock raising and agriculture, shipping at least a carload of cattle each year, and disposing of two thousand dollars worth of horses during the course of seven years. When Mr. Puryear first came to this place there was merely a small cottage on it. This he has rebuilt into a comfortable modern dwelling, also has erected a good barn which he replaced in 1910 with a much larger one fifty-four by fifty-four feet on a concrete foundation, which is designed to hold his entire crops and all the stock in separate compartments. Since settling on the place Mr. Puryear has planted liberally of trees, and at one time felled and sawed seven thousand feet of lumber. He came to Nebraska too late to experience the severity of the fearful blizzard of 1888, although he encountered the remnants of it as it spent itself throughout the western part of Iowa. While his stock was out in the open and felt the icy blasts, there were none lost. Mr. Puryear is now interested in raising thoroughbred stock, Hereford cattle, Poland China hogs, and English shire horses, and his stock ranks among the very best in northeast Nebraska. Mr. Puryear was married September 28, 1882, to Miss Melissa White, daughter of John and Martha (Blackstone) White, natives of England and Wisconsin respectively, who lived in McDonough county, Illinois, at the time of Mrs. Puryear's birth, and where she was reared. Four children were born to Mr. and Mrs. Puryear, namely: Geneva, Wilda, Irving and Winfred. Mr. Puryear is an independent in politics and the family are Methodists in church affiliations. of the handsomest and most comfortable ones in his part of the county. It has spacious porches, which add much to its beauty and comfort, and is well situated on a good building site. Mr. Ross is one of the substantial citizens of his community and is well known for his uprightness and integrity. He is a native of Clark county, Ohio, born July 31, 1854, being eighth in order of birth of the nine children born to Joseph and Catherine (Freet) Ross. The father, who was of Scotch parentage, died in Ohio in 1879, being a native of Maryland, and the mother, who was of German descent and a native of Pennsylvania, died in December, 1889. One of their sons, William Ross, served three years in the civil war. Mr. Ross grew to maturity and received his education in his native state, and after leaving school engaged in farming. On May 18, 1876, he married Miss Sarah C. Gipe, a native of Darke county, Ohio, a daughter of Garret and Mary J. (Long) Gipe, both natives of Pennsylvania. In the spring of 1890 Mr. Ross came with his wife and five children to Valley county, Nebraska. In November, 1902, Mrs. Ross fell from a wagon, was run over and crushed to death, being survived by her husband and five children. Their children are as follows: Amanda, wife of A. L. Juett, lives at Laten, California, and has four children; Joseph H. and Charles G. are merchants at Raisen City, California; Mary C., wife of Floyd Miller, of Custer county, Nebraska, has three children; Pearl R., wife of C. V. Stern, of Valley county. In 1900 Mr. Ross purchased four hundred and eighty acres of land in Vinton township, remained there four years, then sold this farm and purchased one hundred and sixty acres of land on section twenty-nine, township eighteen, range fifteen, on which he has erected the house and other buildings, developing and equipping the fine stock and grain farm which he has since owned and occupied. On December 2, 1903, Mr. Ross married Mrs. Florilla M. Mowery, who was born in Adams county, Indiana. Her parents, James and Maria (McCallum) Nelson, came to Nebraska in 1886. The mother died in Sherman county and the father in Valley county, where he was frozen to death, having become bewildered and lost his way returning from Ord. Florilla Nelson first married Daniel E. Mowery, four of whose five children are living: Alta M., married Adeson Musselman and lives near Mr. Ross; Jennie M., Inez G., and Zora J., are still under the parental roof. Two children have been born to Mr. and, Mrs. Ross: David Levi and Wilbur M. Mr. Ross and family worship in the Church of the Brethern [sic], formerly known as the Dunkards, Mr. Ross was largely instrumental in organizing school district number fifty-nine, of which he served as treasurer for several years. Mr. Ross lived in a log house in Ohio, and for eight years occupied a "soddy" in the west. He has endured the many privations of a new country, and weathered one of the worst blizzards, in February, 1890. In 1908 he erected a fine, modern frame dwelling and a large, roomy barn on his farm, together with an excellent water system, adding a silo to his equipment in 1911. A full page view of his well improved place is to be found on another page. 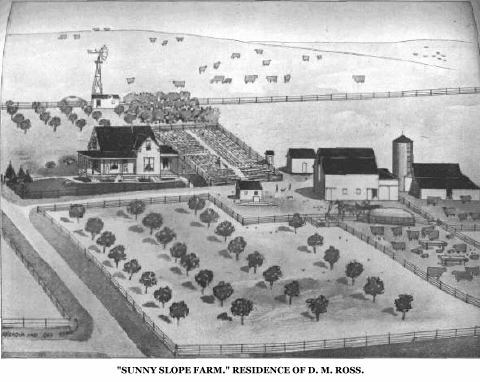 "Sunny Slope farm," Residence of D. M. Ross. The life of this gentleman is an illustration of what grit and perseverance will accomplish in the face of discouragements and misfortune that would appall a less resolute man. George H. Mallory was born in New York City on July 7, 1854. His mother died when he was nine years old, and his father not being in a position to care for him, placed him in an orphans' home. He was brought west with a lot of boys from the institution and bound out to T. W. Smiley, on a farm seven miles west of Monmouth, Illinois, Life became so unbearable that he ran away in 1867, going to Iowa, where he found work near Burlington, husking corn for the Tuman brothers, and remained all winter. In the spring he obtained employment near Calahan Creek, and spent five years in that vicinity. He was married during that time and worked as a bricklayer, emigrating to Nebraska in 1876, and securing a position at Lincoln, working for Holmes & Hogan, in their brick yard. After three years he moved to Colorado, working for one year as a brick burner at Denver and Pueblo, then returned to Nebraska, following alternately farming and bricklaying, in Saunders county, for twelve years. In 1892 he came to Pierce and was employed in the brick yard for three years, and while there was considerable hardship endured by many, he was among the more fortunate and got along very well, following his trade and at times engaging in different occupations. In 1902 he opened a brick yard on his own account, manufacturing cement blocks also. He took in a partner later, but the deal proved unsatisfactory and he discontinued the business.